1. Boil the beans for 3-4 minutes; cool. Skin ¼ of the beans; set aside. Blend the remaining beans in a food processor with 2 garlic cloves, 1 tsp cumin, the juice of 1 lemon and zest of ½, and ½ the mint. With the motor running, trickle in 3 tbsp oil. 2. Preheat the oven to 220˚C, gas mark 7. Rub the lamb with 1 tbsp oil; dust with ½ tsp cumin and season. Heat an ovenproof frying pan. Brown the racks for 1 minute on each side and 30 seconds on each end. Bake for 12 minutes for medium rare; rest. 3. Mix the whole beans with the chilli and remaining garlic clove, lemon juice, mint and oil. 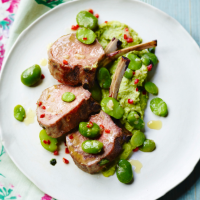 Serve with the lamb and houmous.